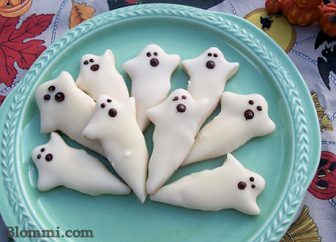 Shortbread ghost cookies covered with white chocolate. Roll out dough on floured surface. Cut out your shapes, and place on baking sheet. Bake until edges just start to show a little color. Baking time will vary according to size of cookies and baking sheet type. Smaller cookies on typical sheet pan with parchment paper may cook as quickly as 12 minutes. Larger ones on an airbake sheet can take twice as long. Set the shortbread cookies on racks to cool. Put chocolate and milk/cream into a shallow microwave safe bowl (it should be wider than the cookie shapes, as yo will be dipping cookies in). Microwave for approx. 2 minutes, stirring every 20 seconds to ensure a smooth unburnt result. Drop the cookies in one by one face down flat. Carefully remove each, watch out the chocolate is hot. As you flip them over to put on cooling rack, hold them with the ghosts "tail" down for a few seconds, so chocolate flows in this direction a little, then lay flat on racks. Once cool add eyes and mouth of ghosts. I used melted dark chocolate, applied with a chopstick (eyes with narrow end, mouth with the thick end). Cut up black licorice would work well also.